Need some ready to run copy for a program or newsletter article about your upcoming Indianapolis meeting? Copy and paste the copy below from our website and into your publication to get attendees excited and prepared for their upcoming Indy visit. Wholesale District: Welcome to the Main Event. Mass Ave: 45 Degrees from Ordinary. Market East: An Emerging District. Collegiate, amateur, professional – Indy has it all, from top-ranked teams to award-winning facilities, and the experience of hosting over 400 national and international sporting events over the past 30 years. Indianapolis is a natural destination for people who love sports. Cheer on the NBA Pacers, WNBA Fever, NFL Colts, NASL Indy Eleven soccer team or ECHL Indy Fuel hockey team. Tour the home of the Colts and Super Bowl 2012, Lucas Oil Stadium. Catch a baseball game at Victory Field, which Sports Illustrated named the named the best minor league ballpark in America. The NCAA Hall of Champions showcases all 24 collegiate sports and the heart and dedication it takes to be a student-athlete. The Hall offers two levels of interactive exhibits to engage visitors, including golf, skiing and baseball simulators and a chance to shoot free throws in a 1930’s-style basketball gym. Visitors can test their knowledge at sport-specific trivia, discover past champions’ stories, and more. A short journey north to Hinkle Fieldhouse on the campus of Butler University puts visitors in the historic arena where ESPN’s #1 movie, Hoosiers, was born when Bobby Plump hit his famed shot in 1954. A visit to the Indianapolis Motor Speedway is a bucket list event. Each May, 33 drivers go insanely fast around the iconic 2.5-mile oval during the world’s largest single-day sporting event, the Indy 500. But the track offers attractions year-round. Adventurous visitors can ride in a real two-seater IndyCar around the track at speeds up to 180 mph. And after speeding past the finish line, they can kiss the famous yard of bricks like past winners. Just down the street is the Dallara IndyCar Factory with 23,000 square feet of interactive and hands-on exhibits centered around the engineering and technology of the world's fastest sport. Speedway Indoor Karting offers a multi-level go karting track for groups or individual visitors. For golfers, Indiana is home to legendary golf course architect Pete Dye and more of his designs than any other place in the world. The Pete Dye Golf Trail celebrates and honors his great work. Experience three distinct designs by the man who finished better than Nicklaus and Palmer at the 1957 U.S. Open, including his first 18-hole design at Maple Creek and Brickyard Crossing with four holes inside the Indianapolis Motor Speedway. You could feast at a different steakhouse every day of your stay in Indy and still leave a few for your next visit. But to find the signature dish of Indianapolis, make reservations at the historic St. Elmo Steak House that still operates in its original 1902 location right downtown. Their world famous shrimp cocktail is made with fresh horseradish ground daily and was recognized as ‘the world’s spiciest dish’ by the Travel Channel. To tame the heat, select a glass of wine from their impressive 20,000-bottle wine cellar. Adam Richman, host of Man vs. Food, found a signature Hoosier dish worthy of a trip to Indiana, and we think you’ll agree. The traditional breaded pork tenderloin sandwich is served as tasty as it is big. Try one at Plump’s Last Shot, a hole-in-the-wall pub owned by Bobby Plump who made the basket that inspired ESPN’s #1 movie Hoosiers. Surrounded by rich agriculture, authentic farm-to-table dining featuring locally sourced ingredients comes naturally to Indianapolis. And visitors seeking innovative chefs don’t have to look far. Goose the Market, a “Top 10 Sandwich Shop” according to Bon Appetit, serves up quality Indiana-raised meats and crafted cheeses, and even offers a bacon-of-the-month club. Only-in-Indy restaurants are plentiful, surrounding visitors with rich history and richer flavors. Indianapolis’ Italian heritage can be experienced at Iozzo’s and Iaria’s, that both opened in the 1930’s, while German heritage shines through at The Rathskeller. Another historic setting, City Market, offers a wide array of vendors selling fresh and local options. And an Indy staple, Shapiro’s Delicatessen, has been filling stomachs with generous portions since 1905. USA Today recognized it as one of America’s greatest delis. For Greek food, head over to Greek Islands where you can taste the authentic flavors of Greece. Experience Mexican dining with a modern twist at Nada or La Margarita. Want to step out of your comfort zone? Head to Fountain Square for Thai food at Siam Square. When the work day is over, Indianapolis comes alive with hundreds of places for good times, good drinks, and good conversation. From happy hour hotspots to late night live music venues, attendees will find themselves in an activated downtown with endless entertainment and networking options conveniently close by. Indy offers a wide range of music venues suitable to all musical tastes, from intimate stages and underground bars to mega stadiums playing popular national acts. Spend a summer evening outdoors with big-name acts at The Lawn at White River State Park or Klipsch Music Center north of the city, or enjoy a picnic dinner while listening to the symphony at Conner Prairie’s amphitheater. Or dance to popular local bands outside at The Rathskeller Biergarten. Discover up-and-coming indie bands at The Hi Fi and Radio Radio in Fountain Square, or listen to jazz at Madame Walker Theatre, Chatterbox and Jazz Kitchen. Catch a blues act at the Slippery Noodle Inn, and find live music to dance to almost every night at Howl at the Moon and Tin Roof. Murat Theatre, Clowes Hall and Hilbert Circle Theatre are beautiful backdrops to great performances from the Indianapolis Symphony Orchestra, Indianapolis Opera, and more. The Slippery Noodle Inn has entertained Indy since 1850. This famed blues bar has history as part of the Underground Railroad and gangster John Dillinger’s favorite watering hole. In fact, two stray bullets from Dillinger’s gun can still be found in the bar’s wall. Located upstairs above the famous St. Elmo Steak House, 1933 Lounge is an intimate, swanky night spot with exposed brick walls that pays homage to the end of Prohibition. Enjoy a signature cherry and vanilla infused bourbon cocktail at the circa 1870s bar or relax by the fireplace with a glass of wine from their 20,000-bottle collection. Nicky Blaines is a hidden underground jewel near Monument Circle with a posh 1920’s vibe and specialties in cigars and martinis. Stop by Bakersfield for tacos, tequila and whiskey or go to Metazoba Brewing Company, a dog-friendly spot with unique craft beers. For a fun experience head on over to Hotel Tango Distillery to taste artistically crafted drinks, or take a tour of the famous Sun King Brewery. For crafted cocktails, some of the best mixologists can be found at The Libertine, ball & biscuit, and Thunderbird. Wine and beer enthusiasts alike will find plenty of handcrafted, award-winning creations to sample throughout Indianapolis. New Day Meadery specializes in honey wines and hard ciders derived from Indiana orchards and honey farms. And a brewing renaissance in Indy has resulted in over twenty craft breweries delivering delicious drafts to restaurants and bars. The Indy Brew Bus is a great way to tour and sample with a personal driver, and the Handle Bar takes beer and biking to a whole new level. While the four-story Circle Centre Mall connected to hotels and the convention center is a favorite among attendees, Indy’s cultural districts are the places to go for locally-made goods and unique finds. Indy offers a variety of shopping destinations from the largest mall in Indiana to small, independent boutiques. The four-story Circle Centre Mall is the shopping hub of downtown with over 100 specialty shops and dining options. The mall is easily accessible, as it’s connected via skywalk to hotels and the convention center and offers plenty of affordable underground parking. On the north side of Indianapolis you’ll find The Fashion Mall at Keystone, with high-end retailers, luxury designers, and fine dining. Visit Mass Ave or Fountain Square to find clothing, art and gifts. Homespun and Silver in the City sell wares by local artists, and Indy Reads maintains the charm of old-fashioned bookstore. For an only-in-Indy souvenir look to People for Urban Progress. This local nonprofit salvaged the roof fabric of the NFL Colt’s old stadium and five miles worth of Super Bowl banners from landfills, cleaned it, and is repurposing it into unique one-of-a-kind products. These upscale, artist-crafted items can be found in their studio in Fountain Square and at several boutiques throughout the city. Live theatre is thriving in Indianapolis, and talent can be found around every corner. From professional productions to eclectic and quirky performances, there is something for everyone to enjoy. Around Indy, the big stages are alive with the sights and sounds of Broadway-style entertainment. Touring Broadway productions come to Indianapolis to deliver memorable theatrical experiences at the Murat Theatre at Old National Center and Clowes Memorial Hall. Independent theatres along Mass Ave allow visitors their pick of off-beat productions. Theatre on the Square boasts two stages and diverse performances ranging from national productions to in-house originals. The Phoenix Theatre is known for thought-provoking, issues-based plays in a contemporary style that mixes in humor. IndyFringe operates under the slogan ‘unexpected all the time’, with an annual festival each August. Beef & Boards dinner theater serves up a dinner buffet with a full-service bar and gourmet desserts every night during performances. Indianapolis museums have garnered international recognition for creativity and excellence. With numerous quality and unique institutions throughout the city, there is bound to be one that appeals to every interest and age. The world’s largest children’s museum, the Children’s Museum of Indianapolis, provides five levels of interactive exhibits and 120,000 artifacts exploring art, science, history and culture. Over a million visitors a year come to ride the antique carousel, dig for dinosaur bones, discover National Geographic Treasures of the Earth, and stare in awe at Dale Chihuly’s 43-foot Fireworks of Glass. The Sports Legend Experience opening spring of 2018 will allow children of all ages to run, jump, putt, drive and play in a 7.5 acre facility that promotes a fun and healthy lifestyle. Conner Prairie Interactive History Park, a Smithsonian affiliate, invites guests to step back in time and made Frommer’s list of “Places to Take Your Kids Before they Grow Up”. Located on 200 acres, this living museum features an 1836 Prairietown, 1863 Civil War Journey, 1859 Balloon Voyage, and more. Rhythm! Discovery Center entertains and informs through music. This museum allows visitors to beat on drums while learning how rhythm and percussion are part of our daily lives and our history. The Indianapolis Zoo signature exhibits range from the International Orangutan Center to the world’s largest shark touch tank and Dolphin Dome. The Eiteljorg Museum is the only museum of its kind in the Midwest, immersing visitors in Western art and the many cultures of American Indians through exhibitions, performances, festivals and hands-on workshops. This award-winning museum offers one of the finest collections of its kind in the world. Uncover Indiana’s secrets through hands-on exhibits exploring the state’s diverse history at the Indiana State Museum, a world-class institution constructed from Indiana limestone, steel and glass. Then venture down the street to the Indiana History Center to discover the state’s past via interactive experiences and archives. And history and literary buffs can tour the Kurt Vonnegut Memorial Library as well as the homes of James Whitcomb Riley and President Benjamin Harrison, all Indiana natives. The Indianapolis Motor Speedway Museum captures the rich 100-year-old history of the world’s fastest sport in the ‘Racing Capital of the World’. And Dallara IndyCar Factory uses 23,000 square feet of interactive and hands-on exhibits to convey the intense engineering and technology behind the sport. The NCAA Hall of Champions showcases all 24 collegiate sports and the heart and dedication it takes to be a student-athlete. Situated on 152 pristine acres of gardens and grounds, the Indianapolis Museum of Art is an impressive institution. The collection of 54,000 works spans 5,000 years of African, American, Asian, and European history, making it one of the largest encyclopedic museums in the country. Find Robert Indiana’s original LOVE sculpture here, not Philly or New York. Those wanting a more hands-on art experience can nurture their artistic side by taking one-night pop up classes accompanied by wine and beer at the Indianapolis Art Center. The Art Center is also open to guests interested in perusing works by other talented and creative local artists. City-wide gallery tours are available on the first Friday of every month. This free, self-guided art event brings visitors and residents alike to galleries all around the city. There are also over 30 miles of greenways and trails winding through the city for runners and avid bicyclists. And just northwest of downtown is the nation’s sixth largest state park, Eagle Creek, which offers 3,900 acres of trails, a 1,400 acre lake, ropes course, and ziplining. To the east is Fort Benjamin Harrison State Park with 1,700 acres of hiking and mountain biking trails. Indianapolis is home to more memorials honoring our nation’s veterans than any other city in the United States, second only to Washington, D.C. Acres upon acres are dedicated to honoring and remembering past heroes. Monument Circle is the iconic heart of downtown, and visitors can get a spectacular eagle-eye view of the city from atop the 284-foot Soldiers & Sailors Monument. Just a few blocks north, the Indiana War Memorial Plaza Historic District contains two museums, three parks, American Legion’s headquarters, and 24 acres of monuments, statues, sculptures, and fountains. The Shrine Room at the Indiana War Memorial is stunning, with red marble and materials from around the world to symbolize the world-wide nature of the war, 24 stained glass windows and a 30’-tall suspended American flag hanging over the Altar of Consecration. The lower level is the free Indiana War Memorial Museum that displays Indiana’s participation in wars throughout history. The Central Canal runs through White River State Park and is home to the Congressional Medal of Honor Memorial, where twenty-seven curved glass walls represent medal recipients from 15 different conflicts from the Civil War through Iraq and Afghanistan. A sound system plays recorded stories of medal recipients for visitors. Also along the canal are the USS Indianapolis Memorial and the 9/11 Memorial. North of town, visitors can find the nation’s third largest cemetery with its peaceful, park-like grounds and beautiful architecture and sculptures. Crown Hill is the final resting place of several U.S. Vice Presidents, John Dillinger, members of the Vonnegut family, Alexander Ralston, and James Whitcomb Riley. Traveling to and around Indianapolis is easy, convenient and affordable. Known as the Crossroads of America, Indy is within a day’s drive of over half of the country’s population. For those arriving by air, the LEED-certified Indianapolis International Airport is a short, low-traffic 15 minutes from downtown. Indianapolis, its hotels and venues, and the Indiana Convention Center are committed to green operations and environmentally-conscious meetings. Traveling to Indy just got much greener, with the Indianapolis International Airport becoming the nation’s first LEED-certified airport. The Midfield Terminal is 1.2 million square feet, making it among the largest LEED-certified projects in the country. Low impact construction, clean storm water, reduction of aircraft taxi times, low-emitting materials, and very high recycled and regional material usage contributed to the certification. They also own the world’s largest area of solar panels, over 100 acres. The Indiana Convention Center’s green initiatives include food recycling and repurposing through Second Helpings - a nonprofit that redistributes leftover banquet food to homeless shelters, a line of biodegradable disposable serviceware, paper towels and tissues, water stations in lieu of bottles for attendees, and an abundance of natural-light flooded entry ways that reduce the need for artificial light sources. Georgia Street serves as the connector between the Indiana Convention Center and Bankers Life Fieldhouse. It has been transformed into a pedestrian-friendly, European-style boulevard perfect for unique outdoor events. The wide boardwalk is made of sustainably harvested hardwood, and a rainwater infiltration system reduces the amount that reaches the city sewers and reduces potable water use for irrigation. The street is lined with energy efficient lighting, recycling containers, and trees and native plants reduce the urban heat island effect. Throughout downtown and adjacent to the convention center, a lane of car traffic was removed to make way for the innovative Indianapolis Cultural Trail, a new $63 million, 8-mile bicycle and pedestrian path that connects visitors in a green way to hotels, restaurants, shopping and attractions. The walkability, bike-friendliness, and compact design of the downtown greatly reduces transportation needs for planners and attendees. A system of climate-controlled skywalks connecting hotels, shopping and dining to the Indiana Convention Center and Lucas Oil Stadium keeps the city walkable in rainy or cold weather. The new Indy Bike Hub at City Market, operated by Bicycle Garage Indy, and Wheel Fun Rentals in White River State Park provide easy access to bicycle rentals. Guests staying at the Conrad Indianapolis or The Alexander can utilize the hotel bicycles free of charge during their stay. Whether your group is interested in planting trees, working with local students, or cleaning up a neighborhood, Indianapolis and its wide range of organizations provide ample opportunities for your attendees to engage in corporate social responsibility initiatives. 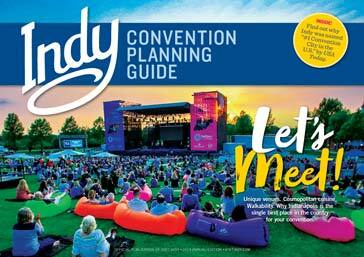 Your Convention Services Manager and the Visit Indy team can help connect you with a service project that fits your needs and goals. Here are just a few examples of local organizations you can partner with.